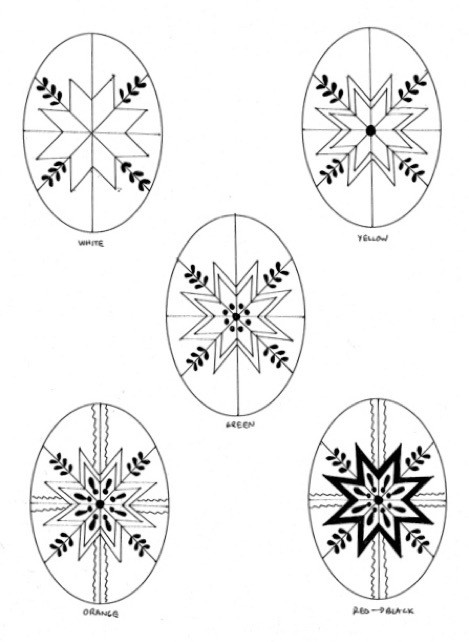 When considering a pattern, first we have to consider 1) the complexity and 2) if we have the colors necessary. 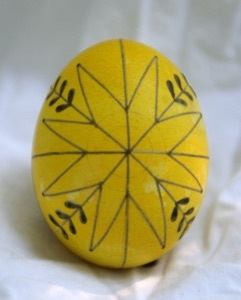 The pattern is a fairly simple one, and the colors are the very basic ones, which we have, so we are ready to start. The red arrows shows the division of each of the eighths in half, to help with the drawing and placement of the star. 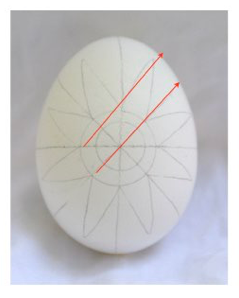 I’ve also drawn a double circle into the center. Why? To help me draw these nesting stars. Note that the sides of the points of the star are parallel to the line opposite (red arrows). 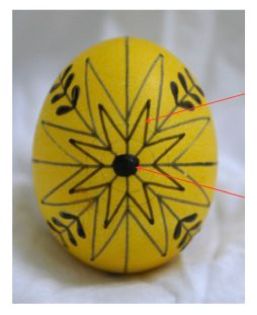 You can sketch in the inner star if you wish, but it really isn’t necessary–you can draw it with wax later by following the outline of the outer star. When writing with the stylus, use long, broad strokes. Short strokes will look scratchy and make your lines look wobbly. Next we need to fill in the leaves. This can be done with a medium stylus, but is much easier with a large/wide point stylus. Remember to cover thoroughly with wax, because missed areas will show up as black spots later. 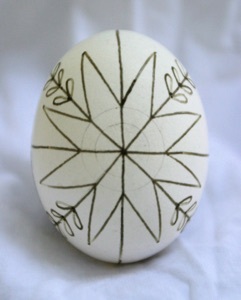 Having waxed in all the areas on the pattern marked white, we can now dye the egg. First, though, it should spend a few minutes in the vinegar rinse (a solution of about 2T vinegar to 1 cup water). 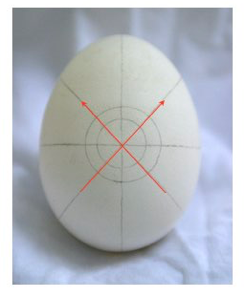 I normally leave it in until I see bubbles begin to form on the surface of the egg. 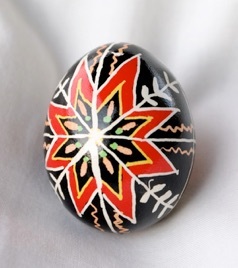 Don’t forget and leave the egg in too long–the acid can destroy the protein coat of the egg and thereby ruin your pysanka. Don’t worry–everything under the wax is protected, and has remained white. Now it is time to apply more wax. And you can now understand why we use beeswax–it turns black when heated in the candle, so that your lines really stand out! All is going well so far. The next color in our pattern is green. There are two ways to approach this. 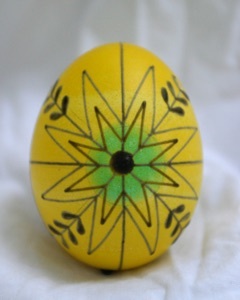 One is to dye the entire egg green, and then apply the wax; the next color, orange, will remove the green. 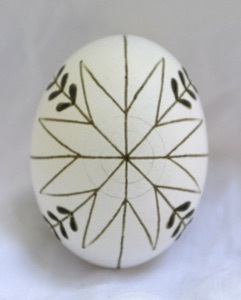 On this particular pysanka, though, there is only a tiny area of green, so we can apply the dye with a Q-tip (cotton-tipped applicator), let it dry, and then wax. Why do we do this? 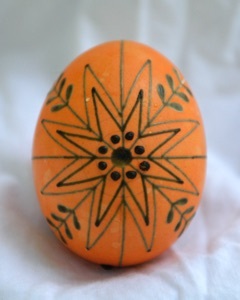 Because putting the green egg in orange dye will muddy the orange dye, even if the green is successfully removed. 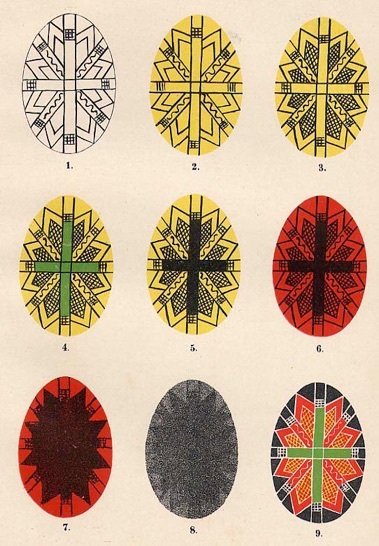 Next we compare the yellow and green patterns above, and determine that we need to make a bunch of dots in green. Once again we will need the heavy stylus; it makes much nicer, rounder dots than the fine or medium. Notice how nicely the green has been removed! Orange is the only color that will do this, largely because it is made without vinegar. A vinegar-based orange/pumpkin will not remove darker colors, and another method would need to be used. 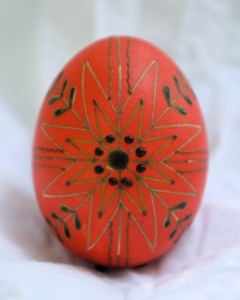 The black of the beeswax really stands out against the red background! Red will be our last color to wax. Look at the pattern, and find the differences between orange and red. Did you find them? There is only one thing to do here, fill in the outer star. This appears to be a simple task, but it is all to easy to miss spots when waxing and have “scratches” and “spots” show up in your supposedly solid colored areas. 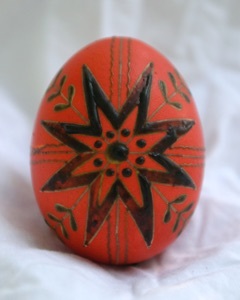 If the star looks well filled in, dye your egg black. 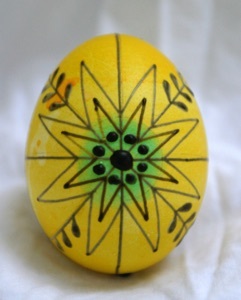 Leave the egg in the black dye a bit longer than the other dyes. This is your final color, so you want a nice, dark, rich coat. 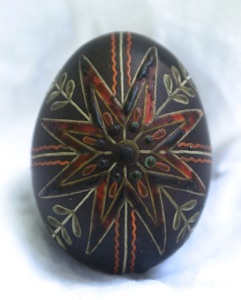 Luckily, black dye is very forgiving, and will often take well even on eggs that have odd light spots, roller marks, or didn’t take the other colors well. 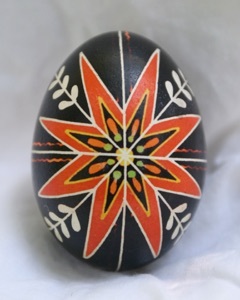 You might want to change the position of your pysanka in the dye at least once while dyeing, so you don’t get a light spot where the eggs rests against the bottom or side of the jar. Now comes the magical part. 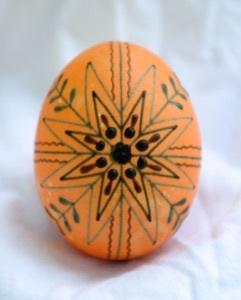 Once the egg has dried well (give it several minutes), hold the egg gently next to the candle flame, but not over or too close to, or you will scorch and get soot all over the egg. Let the wax melt a bit. Wipe it off with a tissue or a bit of paper towel. Keep repeating until you have removed all the wax.